Today is Father's Day. I think that for a very long time I wanted to be a father. And the reason for that has to be (in part) because of my own dad. I have lots of memories of him. People that don't know him well might think he is really stern. He sometimes comes across of quiet and my friends always felt that he was kind of scary. But I think he intentionally cultivated that persona. I think of my dad as a very sensitive man, sometimes prone to emotion. I know that I have seen him cry (but the times definitely warranted it). He is anything but mean. Determined, yes. Full of conviction, yes. But never an angry man. But that all sounds bad, doesn't it? (Sorry dad!) I can think of a time in college when we were working in the corn fields on a very hot August day, harvesting dried up corn for further research. He was several rows ahead of me, picking the good ears and leaving them at the end of each row. I would come along behind him and tag each row and close the bag. One one particular row, I found a red tag with no ears. Dad had left me a note that read "No ears. Love, Dad." I am sure it doesn't sound this way to you, but I found it extremely funny on that very hot August day, just the two of us along in a dry field of corn. I kept that tag and put it in my scrapbook. I still have it today. I remember Dad teaching me to swim in a hotel pool (probably in the Atlanta area, while on the way to Kentucky). I remember his madras swim trunks and his pronounced farmer's tan. I remember Dad always working in the yard, cultivating plants, mowing, watering. We have always had great looking yards. I remember helping Dad create a trellis a few years ago during a visit home. I helped a bit, but I remember how he planned, measured, cut, nailed. I enjoyed being there with him. My Dad is a great man and I am blessed to be one of his sons. If I am a good father, you can thank him for his influence and his constant example. Look at what my family made me for Father's Day! 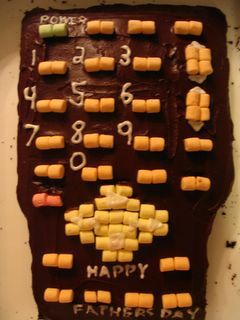 A chocolate cake shaped like a remote control! It tastes as great as it looks! Lovely post, Burb! Your cake couldn't have been more wonderful or appropriate. Congrats on 3000+ satisfied readers! According to the Writer's Almanac: It was Strindberg who said, "That is the thankless position of the father in the family - the provider for all and the enemy of all." Oscar Wilde said, "Fathers should neither be seen nor heard. That is the only proper basis for family life." So what do Strindberg and Wilde know? They didn't have a cake remote like yours. they found in Southern Michigan were: more stones. and stumps to the side of the field and the farmers burned them. Black walnut was no good to them, too hard to work. down in a cool place and eat his lunch. straightened up from his hoeing and answered: I never get tired. Poem: "ONE TIME MY DAD" by Richard E. McMullen from Not Only Love. © Crowfoot Press. Reprinted with permission.